“Whatever it takes”, said ECB President Mario Draghi, in answer to a question on how far he’d be prepared to go in order to save the euro. 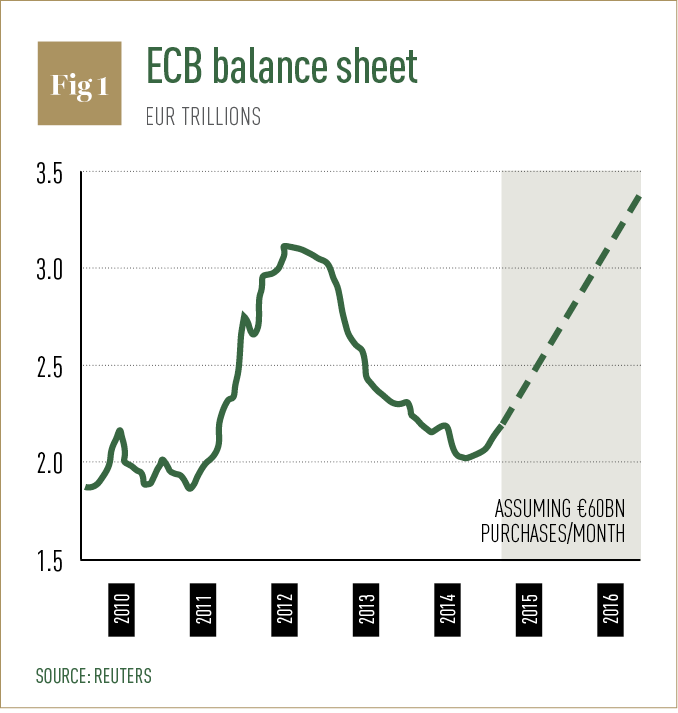 This was in 2013, before the ECB unleashed a €60bn-a-month bond-buying programme (see Fig. 1) and before the bank began to court with the once-radical idea of negative interest rates. Beginning at -0.1 percent in June 2014, the prospect of charging banks to deposit money in certain accounts is one thing many thought unworkable. That was until the ECB, alongside a fair few other central banks on the continent, stepped in to prove otherwise. The policy stance meant that, rather than receiving interest on their deposits, customers would pay a percentage to their banks for keeping hold of their cash: such is the topsy-turvy world of negative interest rates. However, the tool remains a niche one, and we’re yet to see a world in which we all stash cash in our mattresses and seek $100 bills, for fear of the storage space required for lesser denominations. The unconventionality of the policy is seen by the narrowness of its use in history. Only a few banks have been known to employ it, invariably in extreme circumstances and predominantly in Europe. 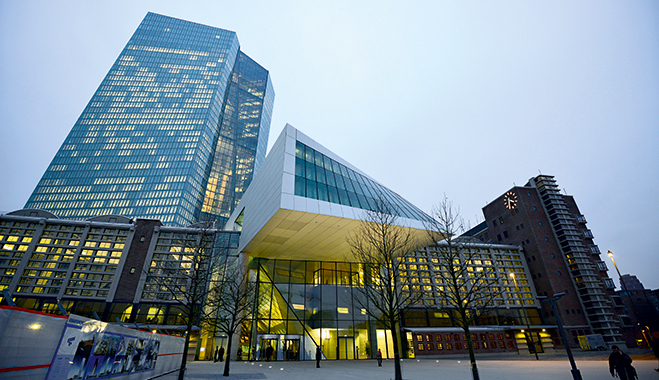 Resorting to negative interest rates is a sign conventional policy has failed to yield much in the way of growth or investment – and the circumstances in which the policy has been enacted in years passed show just that. The Sveriges Riksbank in Sweden slashed its deposit rate to -0.25 percent at the height of the crisis in 2009, only to reverse the decision after no immediate benefits were detected, whereas the Bank of New York imposed a negative rate on deposits over $50m around about the same time. Silvio Gesell supported the idea of negative nominal interest rates in the late 19th century, but the issue was little talked about until Japan’s deflationary trappings towards the latter stages of the 20th century prompted scholars to re-examine his findings. Interest in the policy has since turned from academic to practical, as the financial crisis and the ensuing low to zero interest rate climate has led some in Europe to reconsider the merits of negative territory. The eurozone is suffering from record levels of unemployment and, at the same time, is struggling to fend off deflation, while negative rates could conceivably move money out of reserves and into the real economy where it’s needed most. Switzerland kicked off the trend in mid-2012 when it lowered its certificates of deposit rate to -0.2 percent to more closely mirror the ECB and prevent the currency from further strengthening against the euro. Next up was the Swiss National Bank, which, in December, imposed its first negative deposit rate since the 1970s in a bid to temper the brakes on the waves of cash flooding in from Russia, and keep to a minimum CHF1.20 per euro exchange rate. Later came Sweden’s Riksbank, which slashed its main repo rate to 0.1 percent in February and introduced a QE programme to coincide with the ECB’s, both in order to head off deflation and keep to a two percent inflation target. The measures, taken alongside a more-than-five-year stint of unconventional policy decisions, feed into a wider discussion about the role of negative rates and similarly radical steps in charging growth. Negative interest rates are implemented on various grounds, though the reasons-for generally centres on one of two key factors: discouraging certain investments or boosting lending. The theory holds that keeping interest rates below zero should serve to limit borrowing costs and incentivise banks to lend money more freely to both individuals and businesses. As it stands, the tool is used only in exceptional circumstances. However, with the threat of deflation looming large over the eurozone, the population could conceivably see a time in the not-too-distant future where negative rates are commonplace. If consumer prices continue to fall – as indeed they look likely to do so – negative rates might soon prove popular among struggling European nations for whom deflation is an issue and respite hard to come by. Still, reverting to negative rates is not as simple as it appears , and doing so asks that policy makers radically rethink our relationship with cash – not to mention the school of thought on which many of our economic systems are based. The ‘zero bound’ thesis stipulates interest rates cannot fall into negative territory, yet the aforementioned examples prove the limit can be, and has been, broken on numerous occasions. Where the prospect of zero rates was unthinkable only a few years ago, the journey into negative territory signals perhaps the next logical step in the process. While still very much a radical policy choice, the adoption of negative rates – by some estimates – proves we’ve entered into a new era wherein the zero bound thesis no longer applies and unconventional policy tools are fast becoming the norm. The proliferation of the policy, meanwhile, does not necessarily qualify the measure as an effective policy tool; for every proponent of the system there is another whose criticisms cast fresh doubts over it. The main criticism of negative rates is that, by punishing depositors, the system could prompt savers to keep hold of their cash, in turn stifling the banking system and, in extreme circumstances, threatening a depression. There is a case to be made for charging interest on high-net-worth accounts, but this could risk a collapse if and when the rates were reeled back into positive territory. Assuming the tool is only temporary, it’s clear negative rates can bring only limited benefits and in a short time frame, yet there are some proponents who insist it could be used, not as a short-term fix, but as a sustainable solution. However, the policy is still a significant departure from what has come before inasmuch as charging a percentage on any deposits asks that customers attach a certain financial value to this specific service. And in a period so soon after a financial crisis, consumers are yet to reach a point where their trust is sufficient to accept negative interest rates. Essentially, the policy has grown in popularity because of the excess liquidity banks have injected into the system. The only reason negative rates are even possible is that the attractiveness of assets has deteriorated to such an extent that the returns often dip into – or at least border on – negative territory. It would appear negative rates apart from central bank policy are fast becoming more common. American economist and professor at NYU’s Stern School of Business Nouriel Roubini asserts that, in nominal terms, some $3trn of assets in Europe and Japan have negative rates attached to them. What’s more, an estimated 16 percent of the world’s government bonds come equipped with negative yields, so the policy stance might not be as radical as first thought. As it stands, everyday savers are largely exempt from paying interest on their deposits, and the rate applies rather to big-ticket names such as investment funds and banks. Yet as central banks continue to embrace the once-unthinkable policy stance that is negative rates, the ‘sustainable’ solution, as was said by Goldman Sachs President Gary Cohn, could prove to be a game changer for central banks, for whom inflationary monetary policy has been the preferred option in recent years. The circumstances that have forced central banks into introducing negative rates, however, are less than desirable, and no doubt a healthier financial climate would mean such a policy stance would not hold the same appeal. Negative rates might be the key to growth in the short term, but any party citing the policy as a sustainable solution to Europe’s many and varied shortcomings is misguided. By most accounts, a return to stability will mark a return to conventional economic policy, and negative rates would likely fall out of favour as a result.